The United States Congress designated the Saint Mary's Wilderness (map) in 1984 and it now has a total of 9,826 acres. All of this wilderness is located in Virginia and is managed by the Forest Service. Saint Mary's Wilderness, located in the Blue Ridge Mountains, ranges in elevation from 1,700 feet to 3,640 feet and includes the upper portion of the Saint Mary's River watershed including the Cellar Hollow and Spy Run drainages. The area was mined for iron ore and manganese until the mid-1900s, and evidence of those activities remains along the Saint Mary's River gorge. 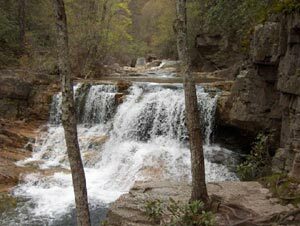 The wilderness is dominated by the Saint Mary's River which narrows to a rhododendron and mountain laurel lined gorge for over a mile and features a significant waterfall. This rugged area is dissected by tributary streams and is comprised primarily of the southern Appalachian hardwood ecosystem. The area contains approximately 17 miles of trail. Trail information is available on National Geographic-Trails Illustrated Map #789 (Lexington-Blue Ridge Mts). Past flood events have changed the St. Mary's River channel and altered sections of the St. Mary's Trail (FT #500). Saint Mary's Wilderness is located in Augusta County in west central Virginia. It is managed by the U.S. Forest Service as a part of the Glenwood-Pedlar Ranger Districts of the George Washington & Jefferson National Forests. Planning to Visit the Saint Mary's Wilderness? How to follow the seven standard Leave No Trace principles differs in different parts of the country (desert vs. Rocky Mountains). Click on any of the principles listed below to learn more about how they apply in the Saint Mary's Wilderness.